The Menu for Hope III campaign has been a great success this year, and there has been over $60,000 raised for the UN Food Programme! Wow, great job Chez Pim for putting together a great food blogging community effort! Thanks Kalyn for making it happen for the Central USA (where I live)! Remember, it is never to late to give what you can. You can always log onto the UN Food Programme website and donate directly to them, or just go to your favorite charitable organization and give. There is a bigger world view than that out of my window. Recent Nobel Peace Laureates Muhammad Yunus, Wangari Maathai, Shirin Ebadi, Jimmy Carter, Kofi Annan, and ones from that past such as the 14th Dalai Lama, Mother Teresa, and Martin Luther King, Jr all have linked Peace with the ending of human rights violations, hunger and poverty. This message has been spoken year after year for at least 50 years at the annual Nobel Peace Lecture. I suspect that these bright minds know something bigger than my world view. Thank You for contributing to the Menu for Hope III! Even the smallest contribute counts because it all adds up. 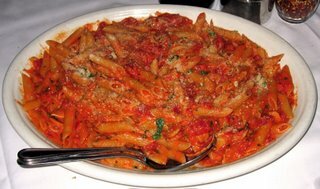 Carmine's in New York opened in 1990, and is the answer to the restaurant theme of "family style Italian". That is get a few expensive dishes, they are huge and share with the table. They opened in the Theater district, catering to large groups who want a decent meal, not spend a total arm and a leg, and feel good before heading to the next big Broadway production. Shortly following Carmine's success, Boston opened Vinny T's (aka Vinny Testas) because how could the famed Boston North End Italians be outdone by New York City? What the rest of the USA has is the chain called Buca di Peppo, which is found in most suburban sprawl areas of the USA, and quite absent from New York City and Boston. I am sure BdP would not last a second in NYC or Boston with the big dogs in the yard. The difference between Carmine's and BdP is that there is someone in the kitchen who really cares about the essence, quality, taste, feel, brand, style, presentation, and delivery of good food to the table at Carmine's. It is not just kitchy with the big platters meant to share, but it is about bringing a feeling of an entire group or family dining experience where party members interact in a foodie-happy way. Carmine's gives he illusion of what family dining should be, or a little throw-back to Leave It to Beaver. The question was when we got to the Bahamas, was Carmine's going to deliver? The answer, I think Carmine's Bahamas delivered. We started with a bread basket which was carefully arranged in the kitchen, so I got a perfect pretty picture. 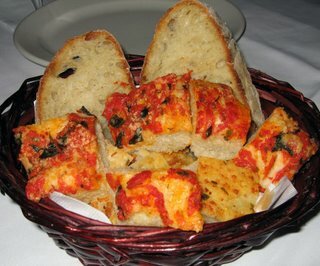 There was one onion focaccia square that was very tasty, and I ate 2 pieces. Our evening got of to a good start. Our table started with a stuffed artichoke and baked clams. The artichoke was tough to eat daintily, but the stuffing had good flavor while I tried to scrape off the inner edible portion of the artichoke leaf and not get artichoke juice down my chin. 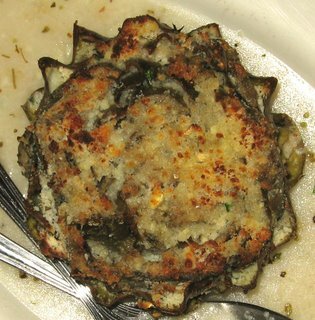 The baked clams has a similar stuffing on the clam, and they were much easier to eat. The next dish we got for the table was shrimp parmesan, similar to what one would think of as veal parmesan, chicken parmesan, or eggplant parmesan, but this one was made with shrimp. The lightly breaded shrimp was fried, then covered in red sauce and melted mozzarella. This was an interesting dish because the shrimp flavor was kind-of dwarfed by the strong sauce and cheese flavor. For our main dishes we got one pasta dish Penne ala Vodka. From the resident New Yorkers at the table, they said this dish compares exactly to what you would get in New York. This dish is a tomato cream and vodka sauce with all the alcohol boiled off. The penne was perfectly al dente in a way that I find difficult to achieve at home. I mean, the pasta was the perfect al dente! Someone in the kitchen either cares about what is being sent out to the client, or they are really reallly really good at following exacting directions. The second dish we got was veal saltimbocca. This dish had a generous portion of spinach under a lot of veal slices with a rich brown gravy and melted mozzarella on top. 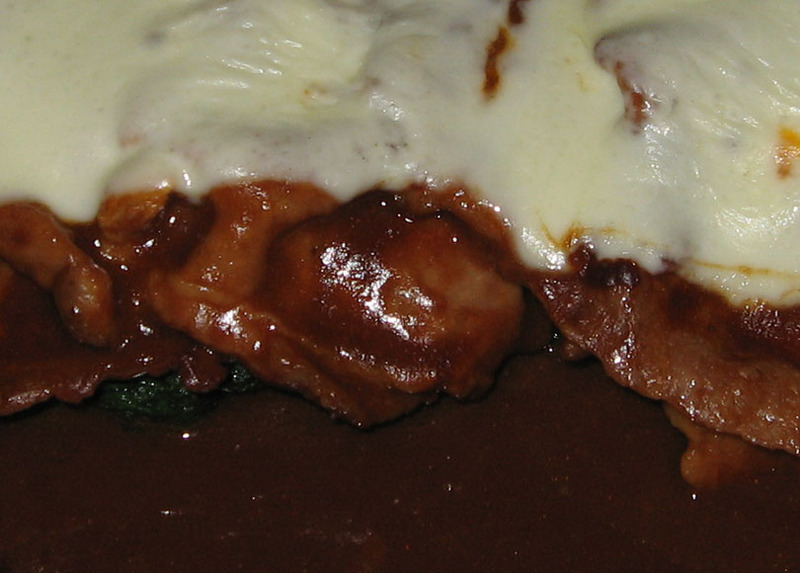 I have never had veal saltimbocca before, and this tasted good, the texture was excellent, and I liked the spinach. All in all, I was surprised at the quality of the food. In my mind, the Bahamas is not known for its culinary excellence, but Carmine's delivered. One thing I did notice about the Carmine's website menu and prices vs the current menu and prices is that the current menu is about 25% more than what you see on the website, so something on the website for $30 is really about $40. It is also the Atlantis Resort and all of its 36 restaurant's policy to automatically add 15% tip to any bill, no matter how small or large your dining party is. I think that is fair because our service where ever we ate was like that of any 5-star restaurant in the USA, but the service was nicer and less snooty in the Bahamas. 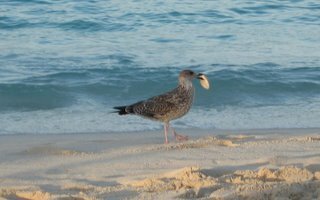 The Bahamas is a separate nation from the USA, so there are different rules for worker compensation I am sure. 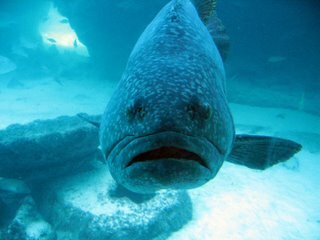 I am sure that the Atlantis Resort takes its share of that 15% tip, leaving the workers with a lot less than what they really worked for. We always left some extra tip in hopes that the cash would go home with the employee, not the "house". The economic disparity on the island is acute. There seems to be huge gated compounds along the water, which I was told are owned by Barry Bonds, Tiger Woods, Sean Connery, Michael Jordan, etc., and then in the center of the island is the working poor. Leaving extra tip money isn't going to change the disparity today, but as Nobel Peace Prize Laureate Muhammad Yunus started out, he gave less than USA $1 to help end the cycle of poverty for one working poor person. 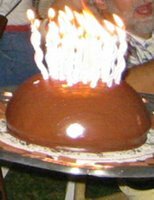 It is my blog's 1st Birthday! Hurray! It has been fun sharing my food adventures with you. I am always looking for really good food from an all American favorite hot dog to excellently prepared toro tuna with saffron and truffles. I hope to be able to share a lot more food adventures for many years to come. For the second year in a row, we left the rat race of our lives for a tropical setting for Xmas. We went to paradise, as many people would call it. This is what we saw. This is one of the many fish we saw in the water. We saw lots of fish of pretty colors, and some sharks too. We saw some seagulls on the beach. 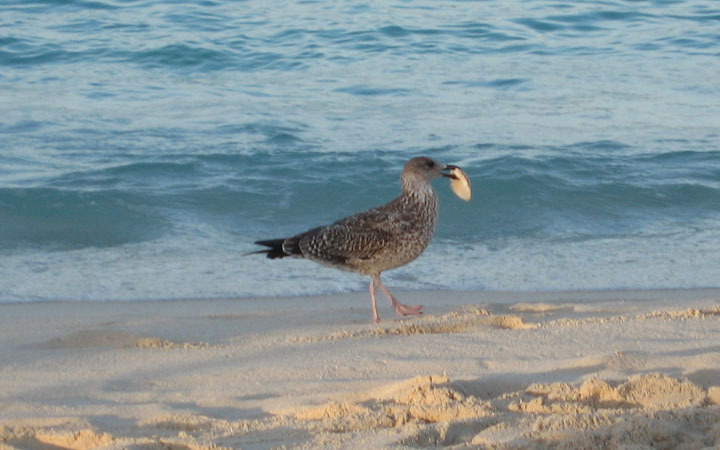 This one found a piece of coconut and seems to be feeling rather proud of that. Here I am sitting on the beach, looking out to the ocean. I think I was thinking that this place is rather nice. Stay tuned for more of my Xmas adventures in paradise. 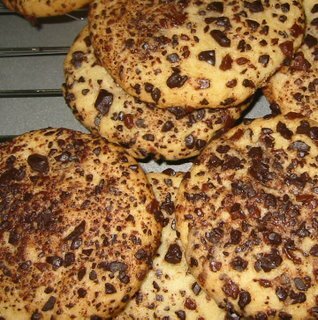 Ok, at one time, along time ago, when I was young, in my 20s, and many lbs lighter, I used to make cookies. I used to make cookies using my Great-Aunt Isabelle's recipes of hand sifted flour, real butter, and the best fruits and chocolates. Great-Aunt Isabelle had terrible arthritis in her fingers and hands, and she never complained about the pain when she was sifting, stirring, and rolling out the dough. Everything she baked was lovingly done by hand. In the honor of her memory, I made her cookies. 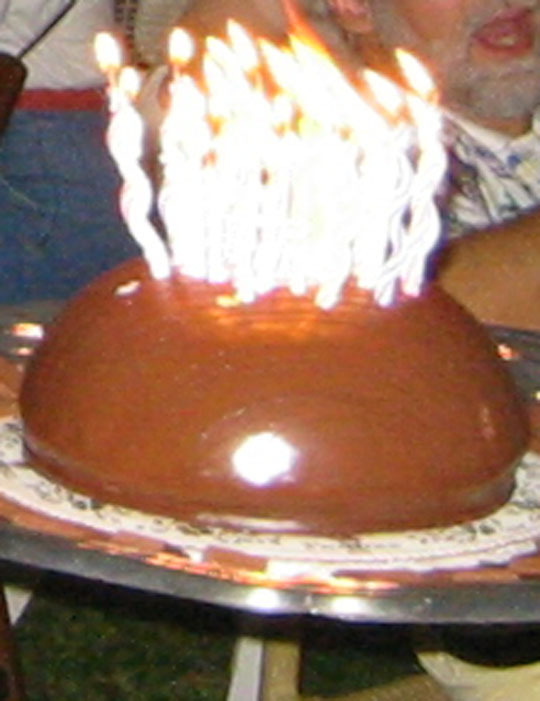 Anyway, these days, my friends and myself are older, many lbs heavier, and avoiding the sweets as best as we can. The last time I think I made a real cookie was 4 yrs ago. For one reason and another, I was making cookies to take to functions, so I cheated. I got a roll Pillsbury sugar cookie dough, and was considering what to do with it. I have never cheated at cookies before, as I feel like I am letting down my Great-Aunt Isabelle. There is nothing like a real butter cookie, especially the one my Great-Aunt made. So, I embarked on this pre-made cookie dough affair. I had to do something to help along these cookies that are generic and manufactured. I thought Chocolate! Everyone loves Chocolate! I took out a large very good 70% chocolate bar, and I hand cut up the bar until it was small little pieces like chocolate sprinkles. I added a shake of cinnamon and cayenne and I was in business. I cut up the dough into small size pieces, like the size of bouncing balls you get for $0.25 in the toy vending machines at the grocery store, then I rolled them in the chocolate, cinnamon and cayenne pepper mix. 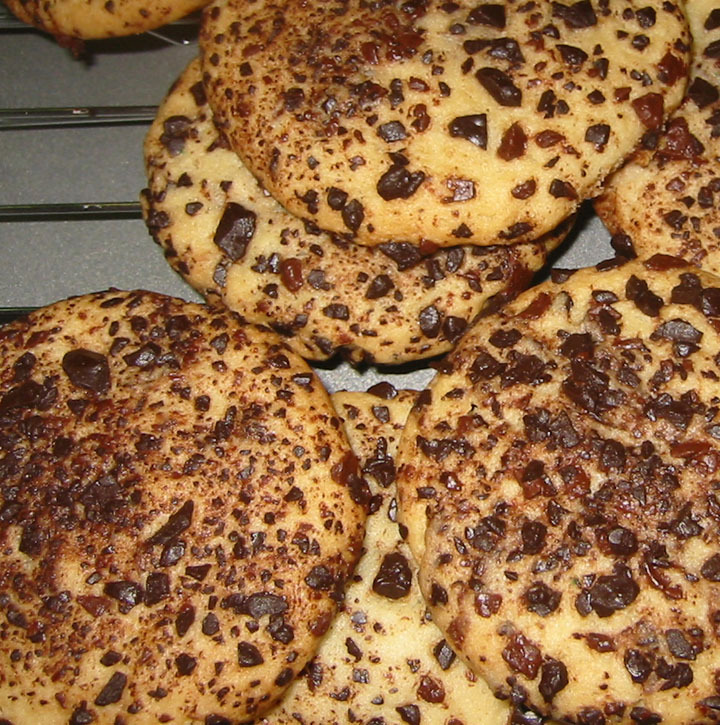 These are what the cookies looked like. They were light, airy, and had a nice coating of excellent chocolate on the outside, that melted in the fingers of those who ate them. There was a light cinnamon tone to them, but I did not add enough cayenne pepper, so the chocolate flavor aftertaste was not enhanced by the cayenne. 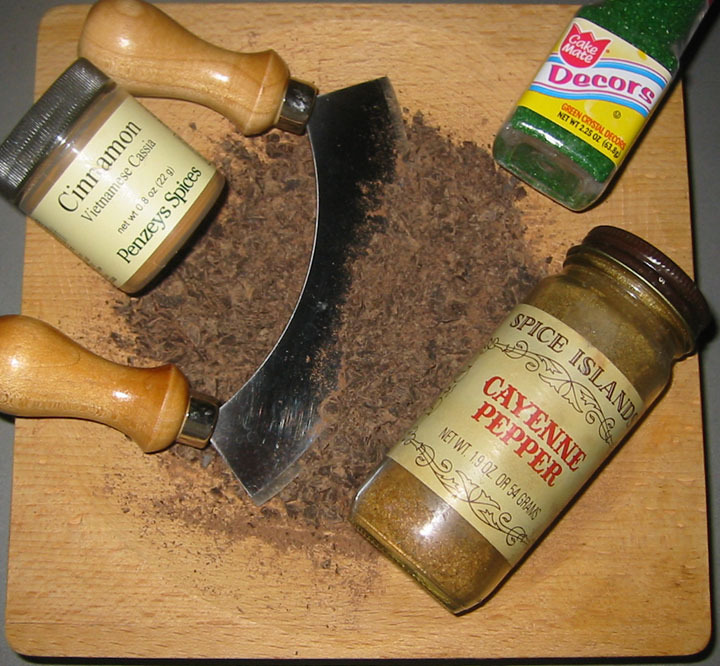 Next time, more pepper. When we, and and all of our friends meet our New Years resolution of losing wt, I will embark on making cookies the way my Great-Aunt Isabelle would have made them. Menu of Hope III has less than one week left (Dec 22) before the "Raffle Ticket" booth for fabulous prizes closes. In one short week, donations just tipped $23,000 (aka MYR 82,500), blowing last years total (about $17,000) right out of the water! This is amazing, just amazing! Please go to the Menu of Hope III giving website http://www.firstgiving.com/menuforhopeIII for a chance to donate funds to the UN World Food Programme. For more exact information, visit Chez Pim http://chezpim.typepad.com/ for more information. Also check back to Chez Pim on about January 15th for results of the super duper Menu of Hope III! Thank you for being a charitable foodie! I wanted to get a strip of char siu, red roasted pork (Masak-Masak gets the good stuff) from a Chinese market on Upper Charlotte. I had not been to this market in about a year, but they had the real deal Chinese prepared meat case with char siu, roasted pork and roasted duck hanging from hooks, so you can see exactly what you are buying. This was very San Francisco or New York of this market! When the owner opened this market about 3-4 years ago, I was so happy to finally see a Chinese Market in town. I had been to every market up on Charlotte, Nolensville, Murphreesboro Rd, and Antioch, and no dice for me. My quest for real good Chinese food in Nashville was on-going for years (and others, see Running Gags who feels my pain), I had almost given up hope, and then this shop owner opened the market to my delight! Most other Asian markets in my town are Korean, Vietnamese, or multi-national, and just don't carry some of the uniquely Chinese ingredients or have the Chinese prepared meats. It is great if you want to make Korean or Vietnamese food, but not so good for specific Chinese ingredients. Anyway, to my horror, after fighting rush hour traffic of the surface roads heading west towards Upper Charlotte (about 5 mi/hr as there is always a wreck during rush hour right outside St Thomas Hospital, yet the ambulance always seems to come from somewhere else and take the crash victims to another hospital...) -- I got to the my Chinese market to find that it has become a Mexican grocery with a Mexican diner attached to it. I felt a bit PISSY after being in traffic for an hour (only 5 miles from my work), it is now 6:30 pm, and I am not even close to having any food in hand to make dinner. The next best Asian Market for Chinese ingredients is back towards my office (another 5 miles) and now the traffic is going the towards town with people wanting to go out on-the-town. I get back to Lao Trading Co., and they were thinking about closing for night, there was guy with the key in door waiting for customers to leave, and then the ladies nod me in because they recognize me. They knew I usually run through the store quick to pick up a few things, and depart quickly, so I would not hold them up for closing time. This time I pick up a pack of NOH Seasoning. Nate, from East Asia, claimed that red pork is easy, just get a package of the red seasoning, and follow the directions on the pouch. Note, easier said than done. 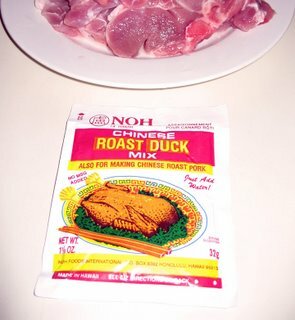 The NOH Seasoning was the closest pack I could find, and on the top it said for duck and "ALSO FOR MAKING CHINESE ROAST PORK". I am thinking "Baby, I got it going now!" I paid my $1, thanked the ladies, and ran to the car. It was some time after 7 pm, and I went to Green Hills to buy pork, I was lacking sanity at this point, and I fought pre-X-Mas mall traffic, to pick up pork. What was I thinking? I should have just gone to Brentwood, 10 miles away in the wrong direction, and it would have been quicker than the 2 miles of Lexus and BMW SUV traffic driven by over extended soccer moms on cell phones trying to jockey for parking position. So I got some thinnly sliced pork chops, and I get home at about 8 pm. I was exhausted, and I still had dinner to make, and this vision of char siu dancing or obsessing in my mind. I was determined to make this red pork! So there! I followed the directions on the NOH Seasoning pouch, and let the pork marinate for 30 minutes. 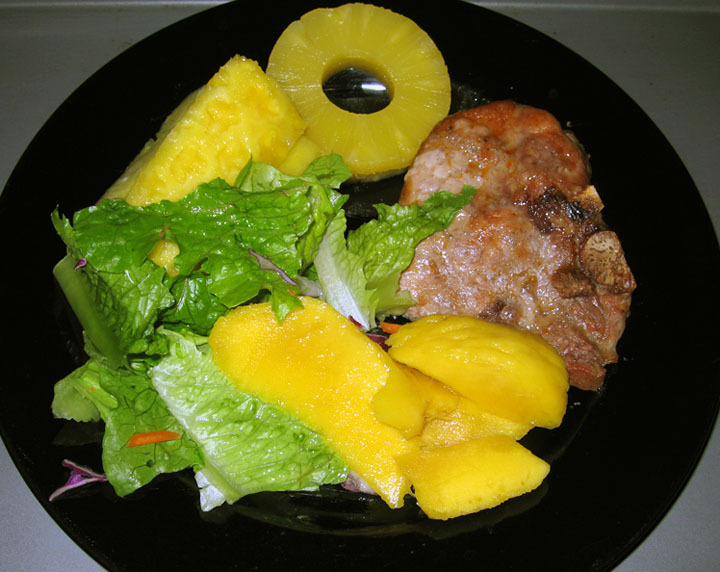 The pork wasn't red, but I thought maybe the pork will turn red once I cooked it. I pop it into the oven, and 30 minutes later it was after 9 pm an then TA DA! NO RED CHAR SUI PORK! AHHHH! The pork chop was juicy and cooked all the way through, and that was good. The NOH Seasoning had good flavor. I presented my Russian Service Plate as the pork on top of a lump of short grain brown rice, next to sliced mango, sliced pineapple, romaine lettuce greens, and a leftover slice of canned pineapple. The dinner was good, but it ain't no Char Siu Red Pork! What have I learned? I gotta go to San Francisco, New York, Hong Kong, or Malaysia more often if I want Char Siu pork because it ain't happening here! Every year, Food Bloggers from all over the world get together for a fundraising campaign. We call our campaign 'Menu for Hope'. Last year, we raised $17,000 to help UNICEF. This year, Menu for Hope III raises funds to support the UN World Food Programme. To us Food Bloggers, food is a joy. On our blogs, we celebrate food as a delight and even an indulgence. Unfortunately, many others who share our world do not share that privilege. For them, food is a matter of survival. This "Menu for Hope" is our small way to help. Together we've come up with a great list of amazing food related prizes for this raffle. Click here to view the prizes. Each US$10 donation will buy you one virtual raffle ticket toward a prize of your choice. 1. Choose a prize or prizes of your choice from our Menu for Hope. 2. Go to the donation site at http://www.firstgiving.com/menuforhopeIII and make a donation. Check back on Chez Pim on January 15 for the results of the raffle. I don't know much about Vietnamese food, but I do know I like Kien Giang a lot. 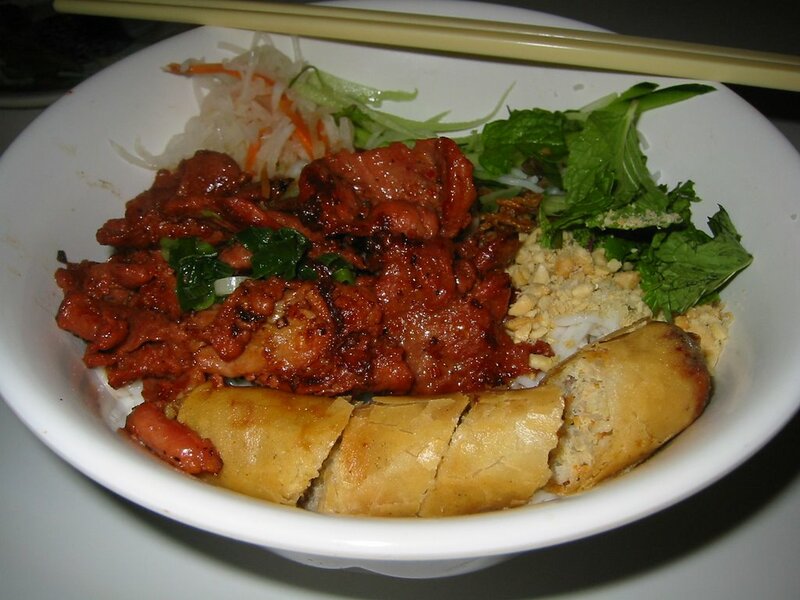 We are lucky to have a few Vietnamese restaurants in Nashville, and Kien Giang is the one with the most longevity. Kien Giang is owned by a Vietnamese family, is located in a modest "dead" strip mall, has little ambience to speak of, and diners must get there by 8:30 pm and be ready to order and be ready to leave at 9 pm, when Kien Giang closes. We made that mistake once, we tried to get food at 8:45 pm, and we were turned away due to the lack of time to be able to have the food prepared and eaten within 15 minutes. There are some nights that I do want to go to Kien Giang, but it is already 8:30 pm, and I have to give up that dream for another day. For me, it is worth following all the rules at Kien Giang because this little restaurant is tasty, inexpensive, and family owned. I always like to start my meal with fresh spring rolls. 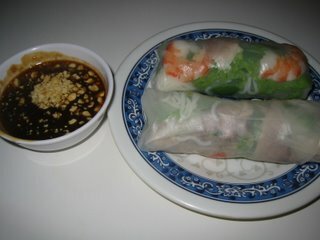 The rolls have rice noodles, lettuce, mint, thinly slice pork and shrimp, and the dipping sauce is a hoisin and peanut sauce. They are fresh, inexpensive (about $2.50 for 2 rolls), and I just love these rolls. I have tried to make this at home, the basic idea is easy, but to get the rolls to be consistently is difficult. It is apparent that the chef has made many of thousands of these. I generally go to Kien Giang when I feel like treating myself to a meal out, but have little money in my walllet. I usually stick to entrees that are less than $6, and in my opinion, I think the entrees that are less than $6 are the tastiest, freshest, and "all that". My favorites are binh mi bi - a pork po-boy with great French bread, banh xeo - Happy Pancake, and vermicelli - rice noodles over a bed of lettuce, mint and peanuts and a light sweet and sour sauce. When I get the vermicelli, I usually get the toppings of charred red pork and fried egg roll. It is the one I like the best, and I ask, what is there not to love about it? I have not ventured to any other Vietnamese restaurant in Nashville because I know I can get a consistently good meal at Kien Giang. As for a lot of good ethnic restaurants in Nashville, Kien Giang is tucked into a hard to find place. It is in the old Kroger Shopping plaza on upper Charlotte, on the south side of Charlotte, and is where Charlotte turns from 2 lanes outbound to one lane. It is now also sharing the plaza with USA Self Storage and K&S Market. 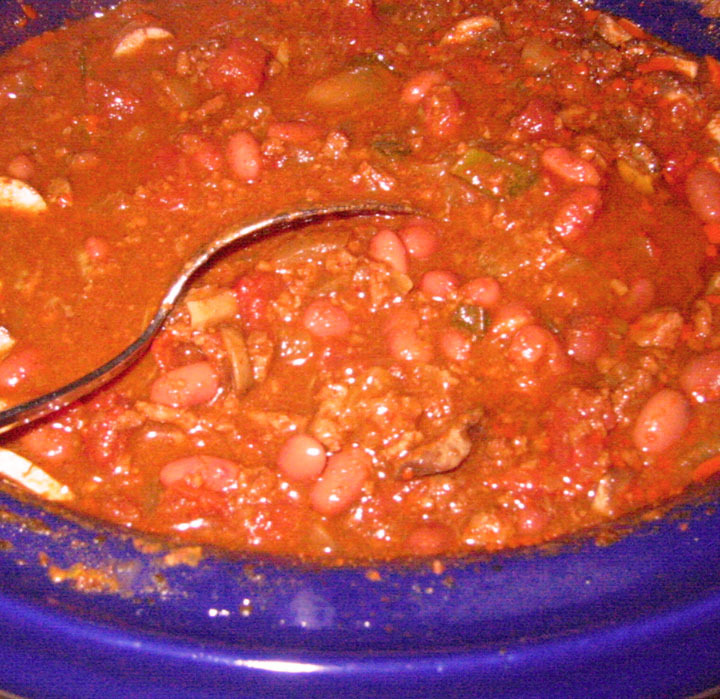 We are having record cold temperatures here (low of 16F) and everytime the weather gets cold, I like to make chili. Here are some of my ingredients. I put them all into the crock pot over night, and ta-da, it is ready to pack in a tupperware for lunch. 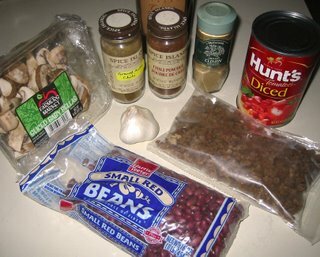 What I normally put into my chili is fresh chorizo, Boca Burger faux ground beef, lean ground beef, garlic, pablano pepper, onion, mushrooms, tomatoes, small red beans, a whole dried ancho, garlic, salt, pepper, cumin, chili seasoning, dried ancho powder, ground annatto, dried red pepper flakes, some red wine, and some stock. I am pressed for time usually with work and running taking up most of my time, and that leaves me being a lazy cook. 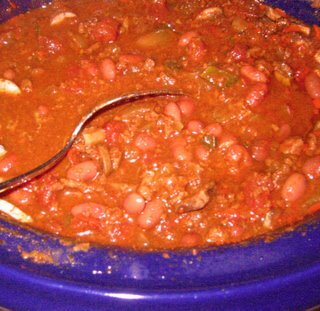 Thank goodness for crockpot cooking to save me time, and provide me with delicious food. So, I woke up in the morning, stuck some red beans into some water, and went to work. I got home from work, drained the soaked beans, diced up the veggies, and tossed them into the crockpot with all the other spices and ingredients and turned the crock on low. The next day, I asked, "Is it soup yet?" And it was. Yum! A nice winter meal that cooked itself. OK, so this post is seemingly a little late, seeing that the 19th Annual Nashville Greek Festival was September 8-10. The Nashville Greek Festival is offered by the Holy Trinity Greek Orthodox Church, on the south side of Nashville. This festival is as much a part of Nashville as wayward guitar players looking for a country music gig. We wait all year long for a taste of the Greek Festival food because the food made at the festival is made by expert cooks from the parish. Many cooks are little old ladies who have a hard time getting around, and really want to participate in their church and the festival, so they offer their family's old recipes and their expert culinary skills to make Greek food for this popular annual event. I dream of the Greek Festival Food all summer long, and I wish we could get this lovingly made food all year long. NOW, read on to the end of my blog entry, as my wish came true! On September 9th, we got to the Greek Festival just at 5 pm for an early dinner. Look at the crowd, these people were thinking the same thing! Gotta get there early to taste all the yummy food! 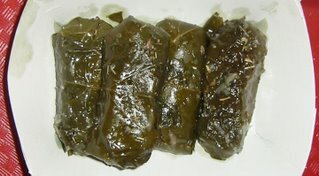 We started with dolmathes, stuffed grape leaves with rice and mint leaf. These are made with olive oil and lemon juice on top. 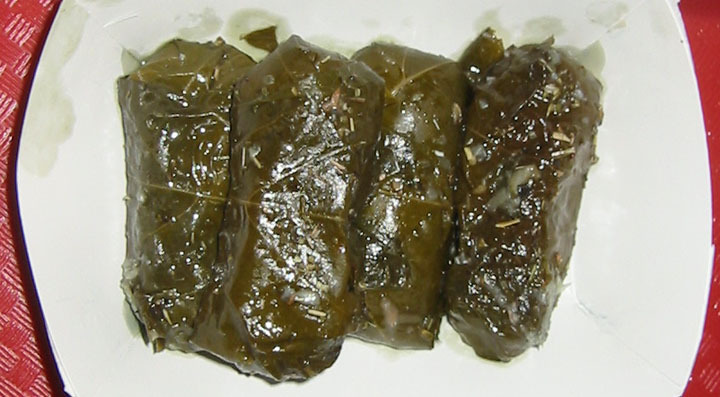 These 5 dolmathes basic flavors of grape leaves, rice, mint, olive oil and lemon are a classic combination that has worked through the ages. Perfect. I could eat a hundred of these and as happy as a pig in s**t.
We got to two types of fyllo pies: spanakopita and chees-akopita. 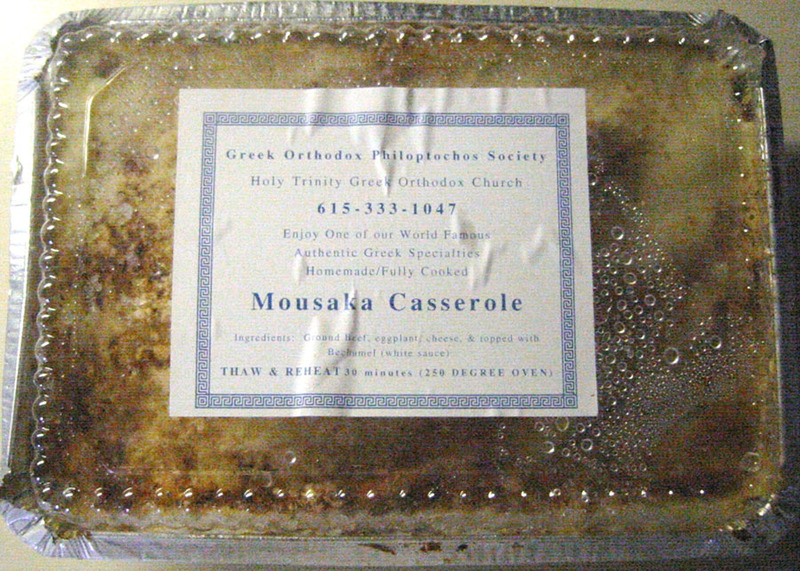 These are hand made by the fantastic cooks at the Greek Orthodox Church, and these are NOT manufactured. The piled high layers of fyllo and olive oil are baked up crisp, and the filling of spinach, onion and feta is just enough to make one say "AHHH! Delicous!" The texture of the crispy fyllo dough and the soft and comforting spinach filling play off each other like Edgar Myer and Bela Fleck do for their duets. Again, I could eat a hundred of these too, and be happier than a pig in s**t.
The plates of dinner we usually get are moussaka and pastitsio. 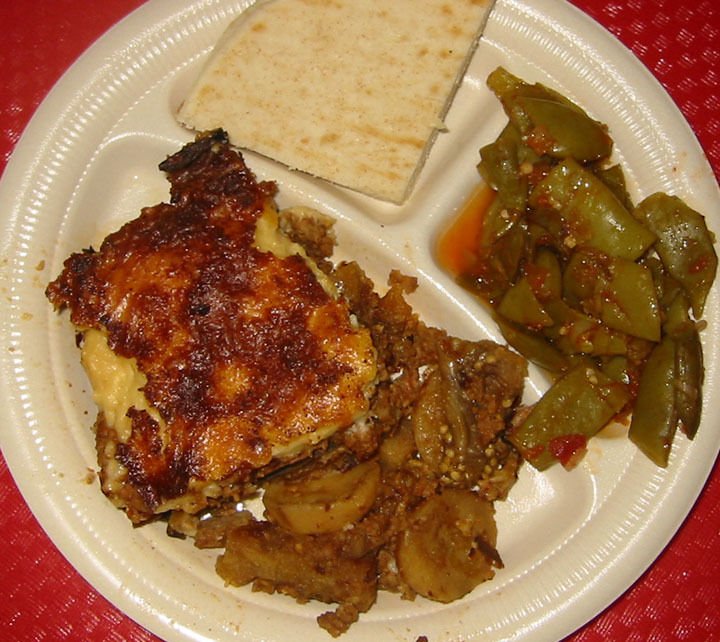 What is pictured above is the moussaka with a side of pole beans and flat bread. This moussaka is made with ground beef eggplant, cheese and beshamel sauce. Everything is always better with bashamel. The eggplant is very tender, and melted in my mouth. The pastitsio was made with inch or longer pasta tubes that look like hollow pencils. I was told that no good pastitsio cook would ever use elbow pasta because the elbow shape does not allow for the cooking heat and sauce to flow through the dish correctly, and the overall texture in the end will not be right. All I can say is that the moussaka and pastitsio at the Nashville Greek Festival defines the best of the Greek-American comfort food that you can get anywhere. 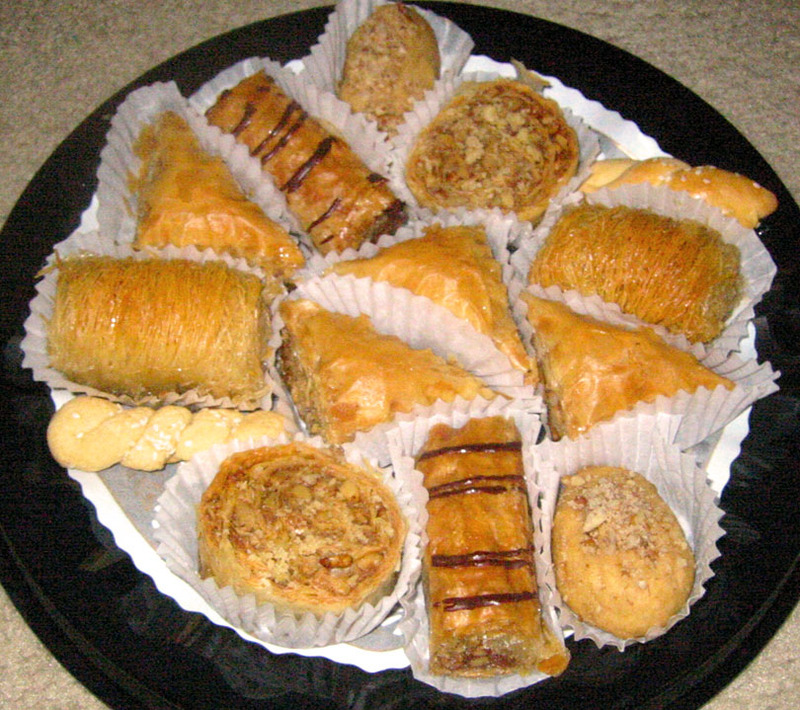 Dessert, well Baklava is always the one that is associated with Greek food. The Baklava is made with lots of butter, sugar or honey and nuts like pistachios, wrapped in butter and fyllo. There high energy and expensive ingredients must have been a special food offering by only the wealthy from 1000s of years ago. 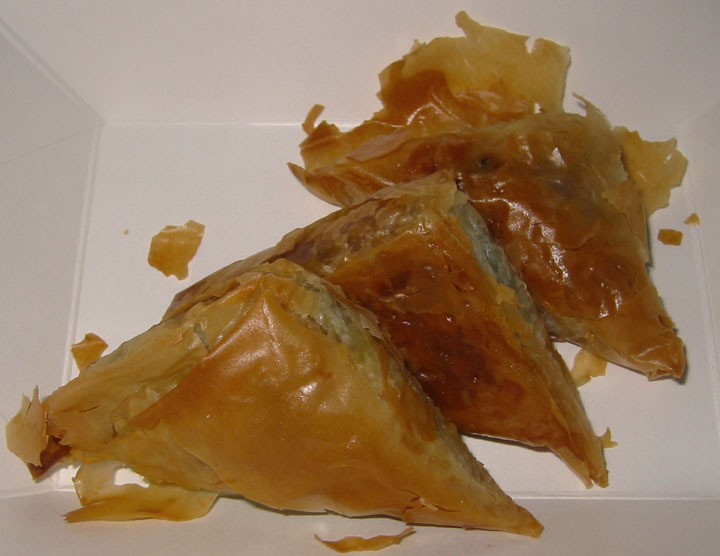 Interestingly enough, Baklava 's origin has been claimed by many regions from the Persian Gulf to far East Asia. What people would not want to claim this special, rich and scrumptious delight? No matter where the the origin is, the Baklava recipe is proof of the rich history of trade for 10,000 years from Eastern Europe to East Asia. Every time I eat Baklava, I feel the history in the core of my being. 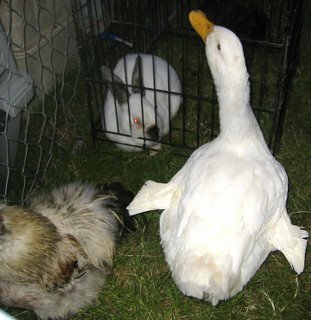 I just added this photo of the Nashville Greek Festival petting zoo with a chicken, goose and bunny. I missed the chicken as it was running to the corner of the pen, trying to hide from the kids wanting to pet it. This is a picture of my frozen mousska that I picked up on Saturday December 2nd! Yes folks, after 19 years of the fine people of Nashville calling all year round to the Greek Orthodox Church, asking for festival food to go, the Greek Orthodox Church has decided to make the food available all year long! YAY! Call 615-333-1047 to find out when the social hall is open, and all the food is frozen and waiting for the oven! YIPPPEEE! I get to have the best Nashville has to offer and delicious moussaka, pastitsio, and spanakopita all year long! 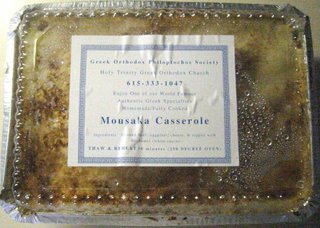 Thank you cooks of the Nashville Greek Orthodox Church! I love you and your food! I will be stopping by as often as I can!